The American Plan Wilderness Vacation & Fishing Vacation Plan Packages are the full meal and service plans. This plan includes breakfast and dinner in the main lodge dining room, a choice of box lunch or shore lunch kit each day, daily maid service, an 18-foot cedar-strip fishing boat with cushion cushion swivel pedestal seats for 2 adults, 15 hp electric start four stroke outboard motor, gasoline, depth / fish finder, electric trolling motor and fish cleaning services. This plan also allows a choice of accommodation in either one our suites, or one of our secluded cabins. Please note that American Plan cabins are charged an additional $10/person per day. American Plan/Full Board with Breakfast & Dinners in the lodge plus shore lunch or box lunch each day plus daily maid service, fish cleaning and an 18′ cedar wood boat for each 2 adults with 15 hp outboard, electric trolling motor and fish finder is priced below for accommodation in our suites adjacent to the lodge. *Rates are for Adults based on a minimum of 2 people in a party. Children/Family Discounts below. 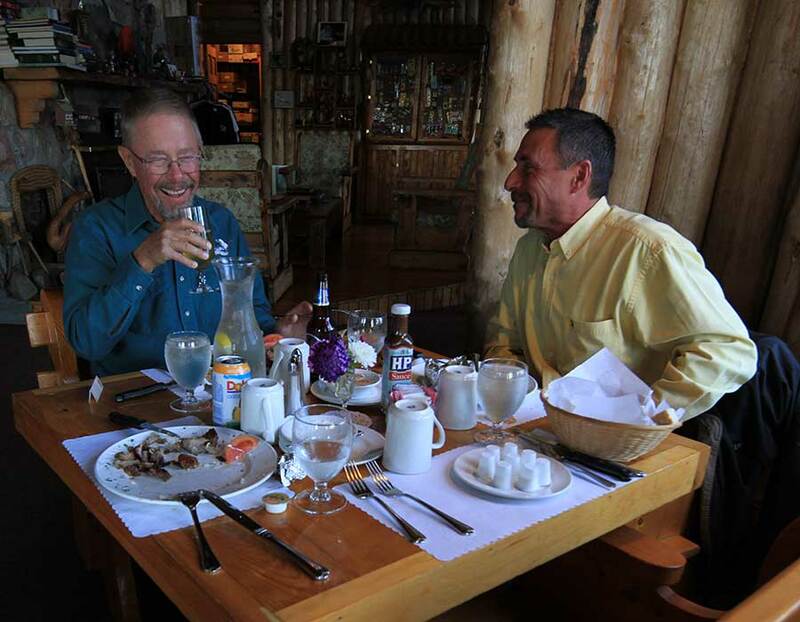 American Plan/Full Board with Breakfast & Dinners in the lodge plus shore lunch or box lunch each day plus daily maid service, fish cleaning and an 18′ cedar wood boat for each 2 adults with 15 hp outboard, electric trolling motor and fish finder is priced below for accommodation in our secluded cabins. *Rates are for Adults based on a minimum of 2 people in a party. Children/Family Discounts below. All prices, and approximate exchange rates, are as of November 2, 2018. Package rates are per person and based on a minimum of 2 people per party. Single supplement is available. In addition to meals and other package inclusions, all Vacation Packages include use of all resort facilities and services including; 18-foot Cedar Boat with Electric Start 9.9hp Outboard and Depth Finder for each 2 adults, Boating and Navigation Instruction Services, use of Canoes and Kayaks, Guided Nature Tours and Wilderness Interpretation Services, Fishing Orientation Services, Fishing Instruction Services, Fish Cleaning Instruction Services, and warm, courteous hospitality at all times. All of our rates are in Canadian Funds. Other currencies are given as a guide and may not reflect the actual exchange rates due to fluctuating market conditions. Our actual exchange rates are within 2% of our bank’s buying rate on day each payment is received or in the case of Mastercard, or Visa the exchange rate is determined by the charge card provider. Rates do not include taxes some of which may be refundable. Rates do not include Tips or Gratuities which are appreciated by our staff but neither expected or automatically charges. We and our staff consider Tip and Gratuities to be gift from guests who have had great vacations.